Full-service design and development of Flash interactive LMS tutorial, customizable for client’s look & feel and selected modules. GeoLearning is the leading provider of Managed Learning Services and hosted learning platforms. The e-learning systems they create, deploy, and manage service big players across a variety of government and private industries, including Dell, Wells Fargo, Chevron, Time Warner, and the U.S. Department of Education.By creating flexible, dynamic, accessible e-learning systems, GeoLearning allows their clients to focus on their businesses, while the continuing education of their employees manages itself. They have made it easy for companies to implement critical education tools for large and small workforces, furthering each company’s interests in their own unique way. 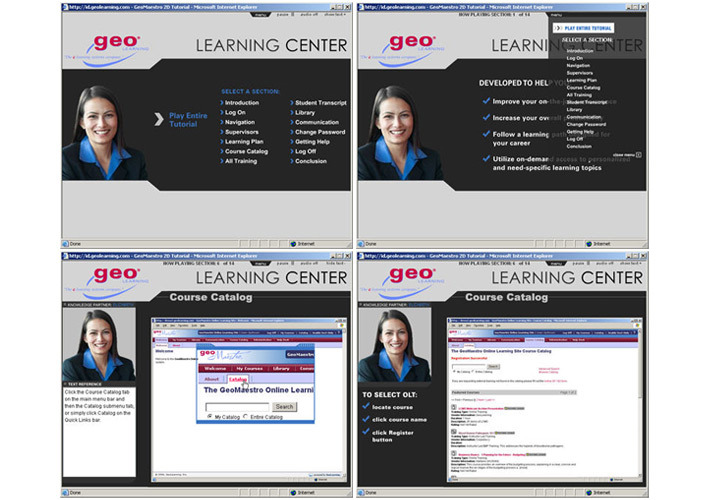 I began my work with GeoLearning developing Flash tutorials for their e-learning systems. After several custom development projects, GeoLearning approached me with the idea of developing a “generic” version of a standard tutorial.The architecture and planning of such a project had to be very carefully considered. It was determined that flexibility was key, and we identified core topics that would comprise the basic tutorial, as well as add-on “modules” that a client could select for an additional fee. It was clear that this “generic” tutorial would be constantly growing and changing to accommodate the standards within the learning systems, so all solutions needed to remain expandable. I needed to create a “template” where sections could be easily added and removed, colors and branding could be customized for each client, screen captures and animations could be switched out, upgrades such as utilizing a virtual Oddcast host instead of standard audio could be easily implemented – not to mention download tolerance optimization and other end-user considerations. Additionally, I needed to develop standards, documentation, and client worksheets to manage the project flow and gather the data needed to efficiently create the tutorial. The ultimate goal was a plug-and-play process whereby a designer/developer could produce a customized tutorial within 15 business days. Working with a select group of GeoLearning team members, it was my role to lead this project. We worked together to identify our general and specific needs, using custom development projects to slowly test and develop the framework and documentation build.My initial involvement was very hands-on with the GeoLearning clients, leading the discussions and interviews regarding the building of the tutorials. Once I had developed a standard process to create a tutorial, I developed project management tools and worksheets, which in turn were delivered to the GeoLearning team to optimize and utilize. Ultimately, we wanted GeoLearning to control the project flow and information gathering, and to reduce my role to that of the Flash developer. The key to building an effective Flash template was understanding all the components involved, their limitations, and how to automate as much as possible in the execution of tasks.The tutorial was built to utilize external files wherever possible. Audio files, screen shots, and animations would change for every tutorial, and these were stored in separate directories external to the Flash movies and called into the pieces as needed. Variables controlling the sections, titles, animations, screens, audio, and more were placed in a single location to optimize the data updating process. Actionscripting was used to call, run, and manage every possible aspect of the pieces, as well as shared library items to reduce the library updates to one spot. I created worksheets for the developer, such as capture scripts, noting all captures needed for a tutorial, lengths of clips, locations of action window placement to help streamline the capture process. Other documentation included an extensive client customization worksheet that offered the client every customization option available in an easy-to-use form to record their preferences. This document then took their answers and automatically generated the first draft of their tutorial script. Through a painstaking cycle of assessing needs, implementing potential solutions, reviewing the results in real application, and adjusting our list of deliverables, we finally had our first generic template after 6 months of development.We continue to improve the template, but already GeoLearning is enjoying the accessible price-point and streamlined process they can now offer, developing 6 tutorials in the 2 months since the template has become available. With the addition of this value-add to their outstanding e-learning systems, GeoLearning has taken a luxury and made it an affordable extension of their services – an upgrade that few can resist!